An opening on the second floor offers a dramatic view of the clerestory that runs the length of the living room. 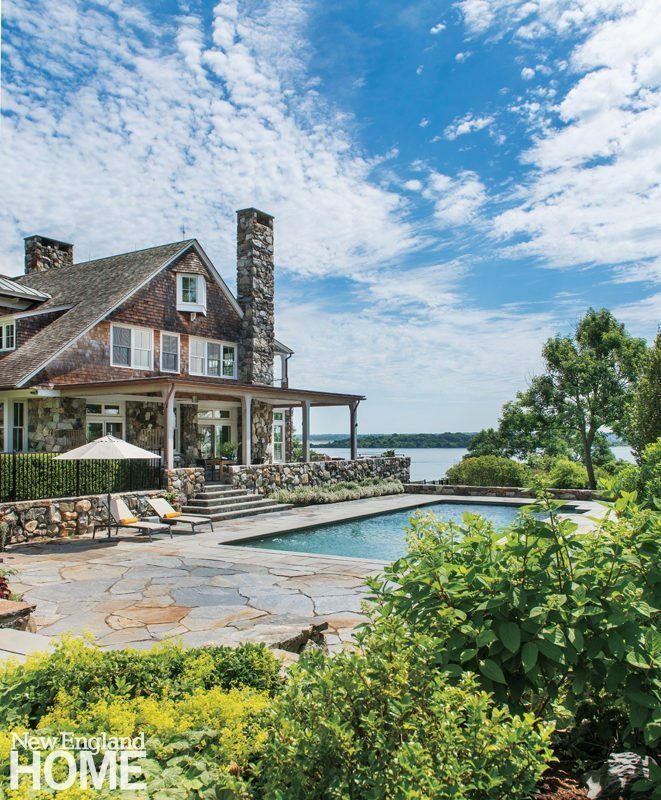 At the far end, a window strategically set into the chimney provides a water view. In the screened porch, the vibe is casual, inviting lingering on slipcovered chairs and a large circular daybed from JANUS et Cie. The screened porch on the third floor invites relaxation with swinging daybeds and a bird’s eye view of Quonochontaug Pond. A view from the mudroom into the tower captures the lighthouse-inspired newel post and the cushioned hideaway beneath the stairs. White grasscloth woven in a herringbone pattern gives the walls of the master bedroom an understated texture that blends with the mild lemon-yellow and gray of upholstered pieces. The wife’s love of bold geometry plays out in the living room’s rattan chairs. A piece of art above the fireplace conceals the TV. 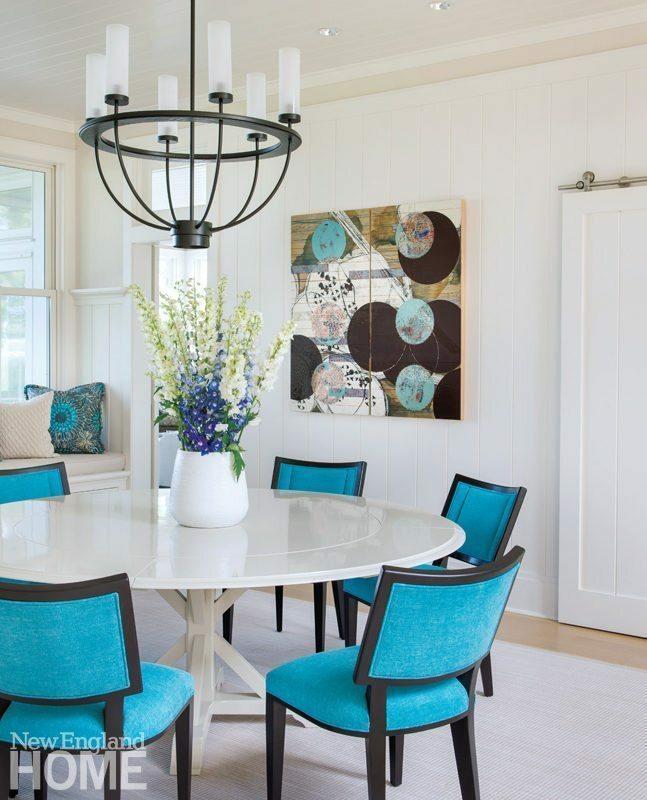 In the living room, artwork collected by the client dictated the blue, white, and yellow palette. 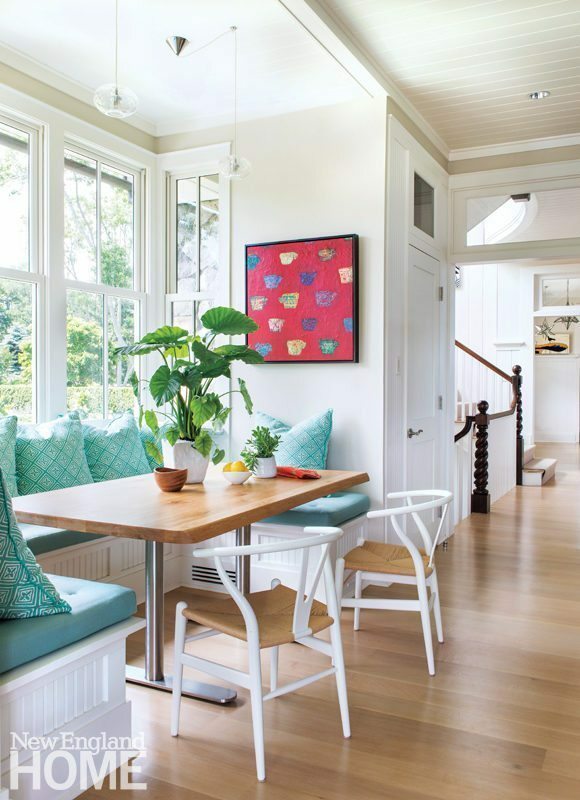 A glassed-in gable and clerestory windows splash sunlight onto a seating area in the “away” room. 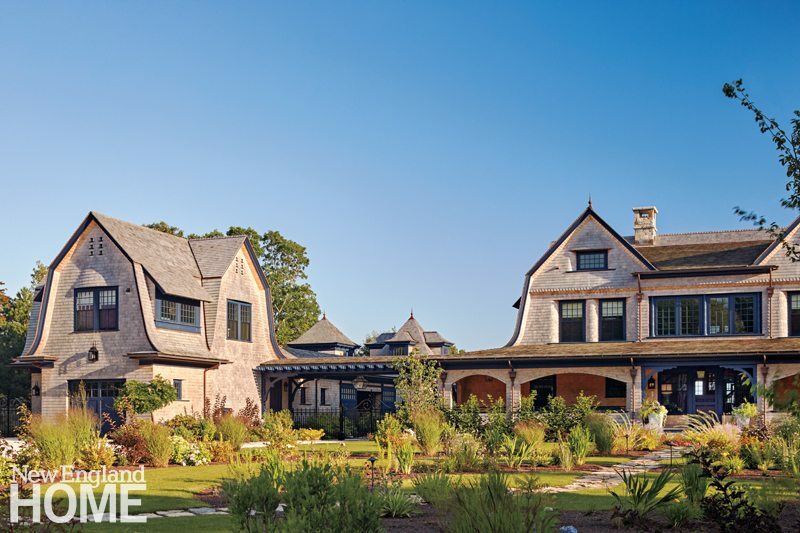 Architect Lyman Goff worked closely with the clients to design a moderately proportioned Shingle-style home. 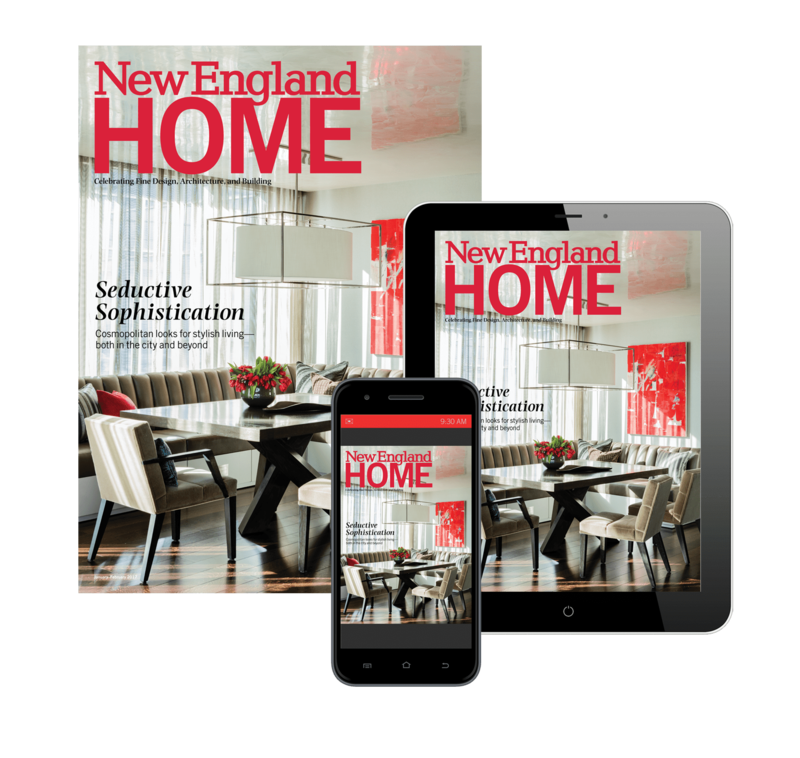 In the front entry, bold artwork and grasscloth wallcovering introduces an interior that’s both edgy and traditional. The rails of the floating dock are made of rope. The gray tones of the master bedroom are complimented by saturated shades of pink inspired by a rag doll the homeowner received from her daughter. Spot, the orange dog, oversees the terrace, where designer Kelly Taylor covered the concrete floor with tile and maintenance-free artificial turf. Featuring a singular chandelier and lively upholstery fabric on the chair backs, the dining room is at once sumptuous and contemporary. The entry foyer got a shot of drama with a recessed ceiling, the ideal home for a dramatic chandelier. The cool grays the homeowner loves form the backbone of the living room’s decor, with blue and gold providing harmony and highlights. The sheer draperies at the floor-to-ceiling windows wear banding at the top, where the opaque fabric hides the window treatments’ mechanics. In the master bedroom, which sits in the original part of the house, a rounded wall of windows offers an almost 180-degree view. On this second floor of the house, the owners kept the original natural fir ceilings. The staircase railing was painted white, allowing the rope-twist newel posts to stand out. Throughout the first floor, cherry floors were replaced with pale oak and natural fir ceilings were painted white to give the house a more summery feel. The new porch offers views of Narragansett Bay as well as plenty of space for friends and family to gather. Plantings around the pool are lush and natural. Goff pushed the rear of the house out to add the glass-walled family room and the covered porch. 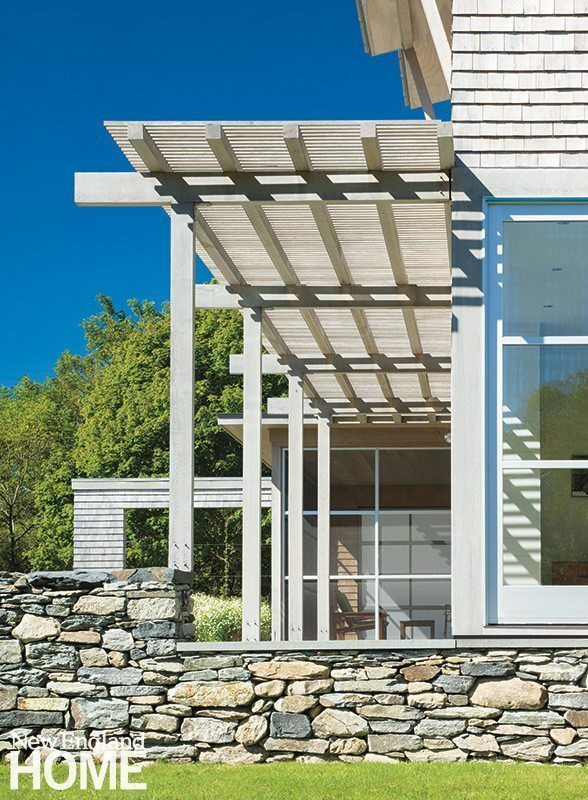 The broad entry allows a view of the sloping front yard, where gentle terracing helps guide rainwater away from the house. Irregular, rounded stone forms a walkway from the drive to the front door. 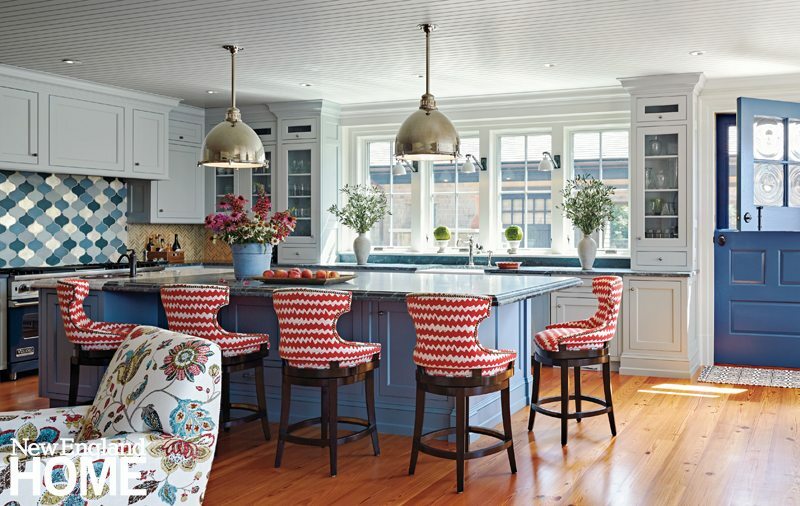 Gale Goff, the architect who designed this Jamestown, Rhode Island, house, returned to forge an addition to expand the kitchen and create a family room. The addition, which segues from the enlarged kitchen to the spacious covered porch, was accomplished seamlessly. Architect Nancy Leslie designed the hardscape, including the basket-weave pool surround. The columns on the second level have a bamboo-inspired shape. Snazzy umbrellas mark the poolside sitting area. 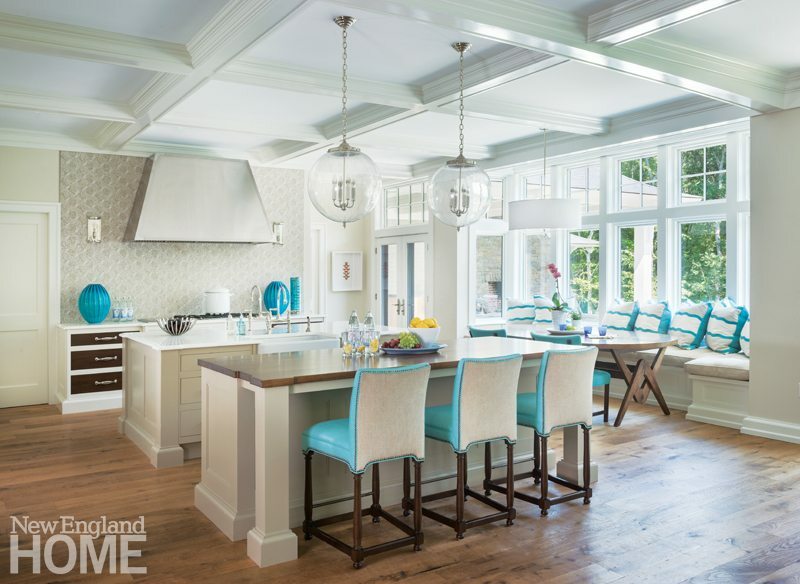 Coping around the pool and spa combines three shades of blue tile. A pergola shades the pool house dining area. A pond view is an added bonus in the pretty pool area. The daughter’s bedroom beguiles with stripes and florals and a romantic palette of blue and lilac. The walls of the family room glow with Benjamin Moore’s jewel-toned Ray of Light, a color that celebrates summer in the warm season, yet—especially when the limestone fireplace is lit—feels cozy in winter. The zippy zigzag pattern of the Stark area rug picks up on the texture of the woven Walters Wicker sofas. 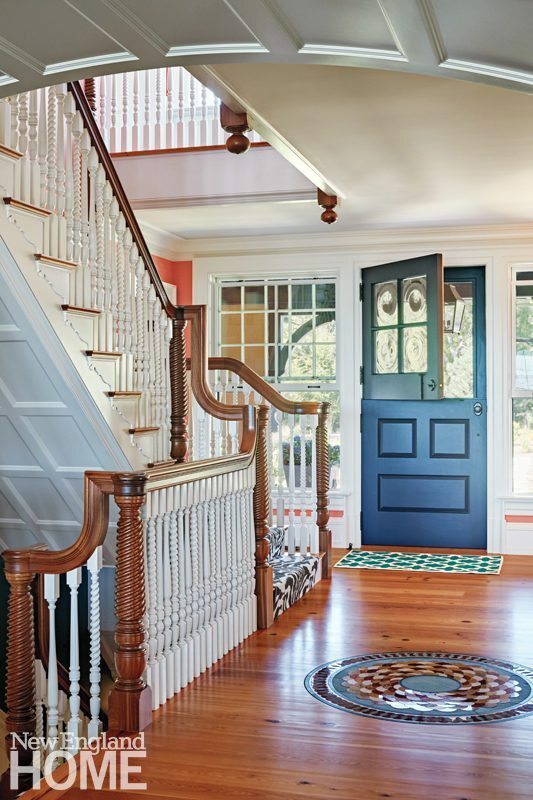 The foyer reveals an artful tile inlay as well as a staircase with hand-turned newel posts and balusters. A cedar ceiling elevates the front porch, as do lanterns from designer Robin Pelissier’s home decor boutique, Robin’s Nest. The wife’s choice of the cadet-blue trim color is just one of the unique touches in this house. The lofty garage holds a second-level guest suite complete with kitchenette. Landscape designer Susan Saunders’s rich tapestry of trees and plantings, including spirea, viburnum, and fragrant clethra, enhances the front entrance. The industrial feel of the deckâs open metalwork is softened by the spiral staircase to the patio. At every turn, wide windows and a multitude of doors connect the indoors with the natural environment. Stone walls, raised beds, low foundation plantings and lush shrubs create a sense of enclosure at the entry of the house. 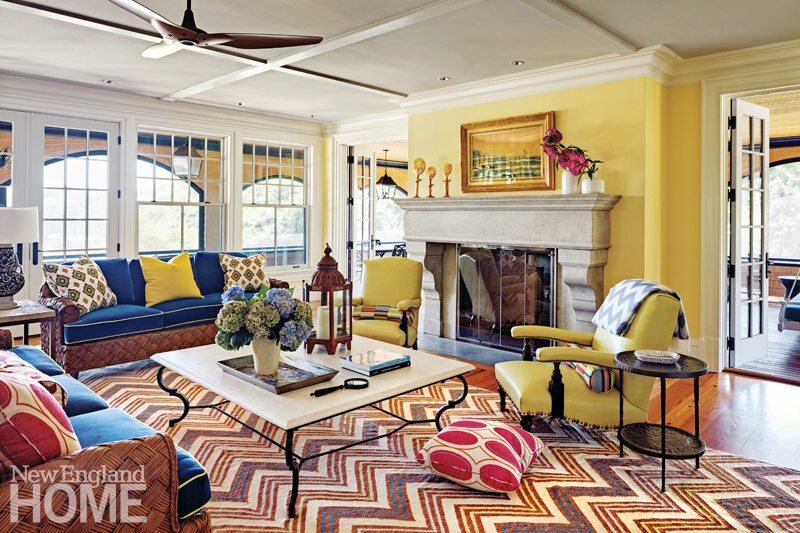 Light floods the home through generously scaled windows, while the barn-like doors, painted in bold shades of yellow and chartreuse, stand ready to slide closed, buttoning up the house for privacy. A home office is tucked in under the third-floor eaves. The L-shaped bedroom was made more intimate and modern with a tufted, upholstered headboard, deep purple walls and green and lavender accents. A Restoration Hardware chaise got a new covering of cushy taupe suede. Conversation (or kicking back) is encouraged, thanks to a custom sectional and reupholstered vintage Italian armchairs. The homeowners were drawn to the unassuming facade of the house. 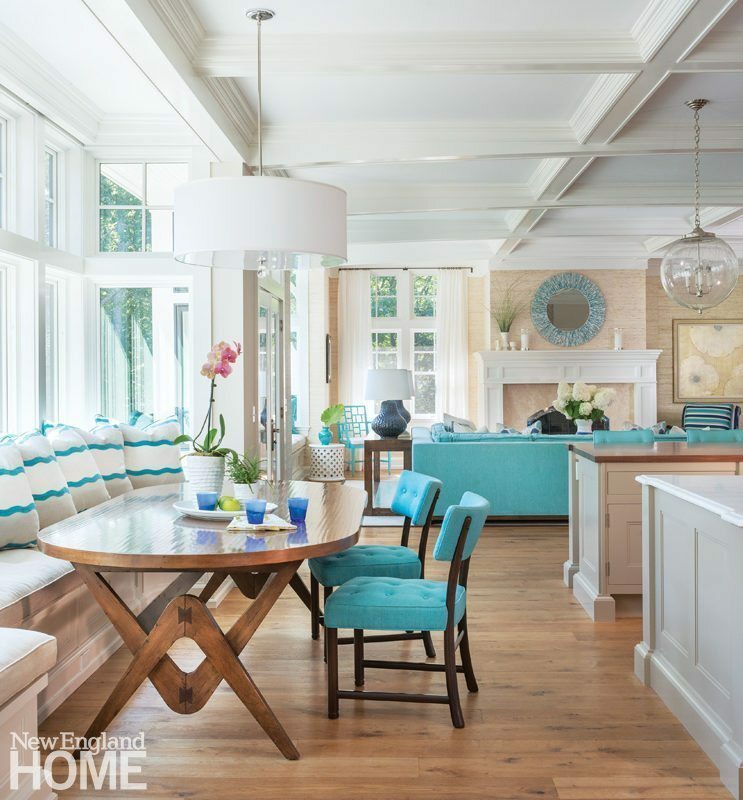 An inviting sitting area is grounded by a custom hide rug and leather ottoman. Spaced boards on the stair walls create a nice interplay between open and closed. The wall of the private stair to the third-floor tower incorporates translucent panels that diffuse the light. The owner (with input from his sister and mother) chose the modern furnishings. A glass wall of windows and doors opens the living room to the yard. Awning windows and sliding doors enhance the relationship between indoors and out.  Architect Jim Estes says he used stone walls, trellis, pergola, and stone paving to "soften the transition to exterior spaces, create outdoor rooms, and blend the house into the site." The use of local stone connects the house to its surroundings.